The name of the facility is Wesley Woods Camp & Retreat Center. The facility is located a few miles south of Indianola, Iowa. We believe you will like our new location. The meeting room & eating area are next to each other. The meeting room has a large projection screen, a mounted projector and a new sound system. The biggest change is the sleeping facilities. Instead of large open rooms we have had in the past this facility has dorm rooms that sleep 2-4 people. Most of these rooms are below the meeting hall with the others a short walking distance away. The facility requires a minimum of two people per room or we will be charged more. If you have someone you wish to room with please write that on your application. If not you will be assigned a roommate. There are a few rooms for couples. You still need to bring your own bedding, towels, etc. The facility allows you to bring food to the dorms. Each dorm has a kitchen & meeting room for visiting or card playing after the meetings. NO ALCOHOL inside or out. They also have a campground with electric hookups. The facility is 5 miles south of Indianola off Hwy 92. PLEASE NOTE: from Indianola please do not use your GPS to the facility. It might take you to an entrance that is no longer used. Please use these directions: Just west of Indianola on IA-92, turn south on County R-63. There is a big church on the north side where you turn south. When the pavement ends you turn left at Nixon St. into Wesley Woods. There are several motels in Indianola as it is a college town. If you have questions about the facility please email us. The registration forms will be on the web site soon. 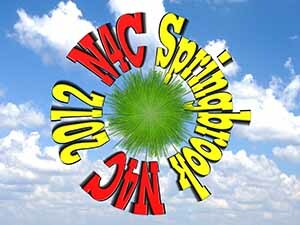 Each Spring, usually Friday, Saturday, and the last Sunday in April, a mini-convention is held. (For many years it was at Springbrook State Park). It begins on Friday afternoon and concludes following Sunday. Excellent programs & workshops are scheduled, interspersed with N4C business meetings, and wonderful food. Cost is minimal. It is a good place to become better acquainted with other photographers from the N4C region in a beautiful natural setting. Each year one or more member clubs host the Annual N4C Convention usually in September or early October. This is held over a weekend; sometimes beginning Thursday or Friday and concluding Saturday evening; or by Sunday noon. In addition, field trips are planned. Programs are planned to interest all photographers, whether new or experienced. Outstanding speakers from various parts of the country offer illustrated presentations on a wide variety of topics. During the convention, winning works from all monthly competitions are on display. At the Saturday evening banquet Photographer of the Year and the Large and Small Clubs of the Year Awards are announced. Individual photographers also receive their awards for their achievements in N4C during the previous year. Watch this video to learn more about the weekend. 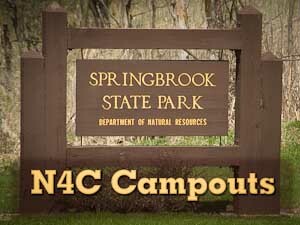 Here you will see more of the Springbrook State Park Conference Center facilities and N4C activities. Photos and video by Carole Kropscot at the 2012 Springbrook session. 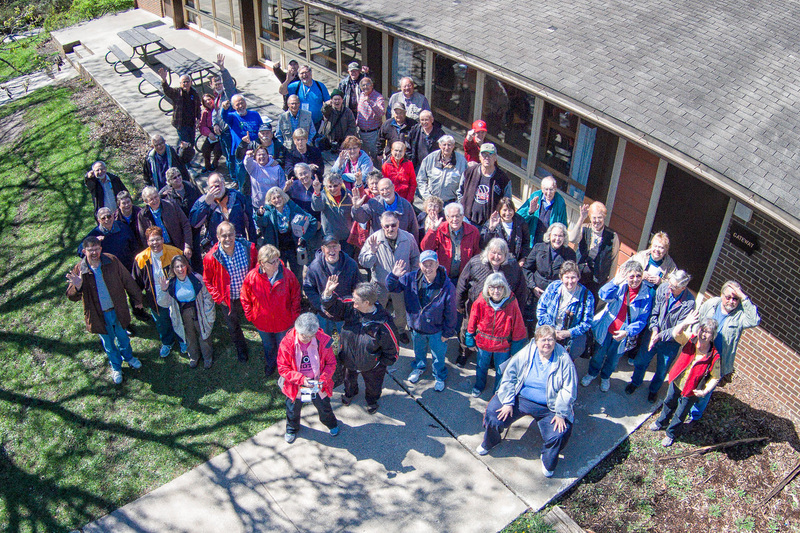 The 2012 Springbrook mini-convention was a lot of fun. Time-lapse video of the group photo and meal times by Ken Johnson. Read the comments below the YouTube video for information about how the video was made. 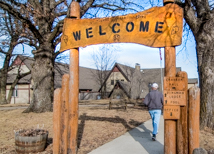 Each Spring, usually Friday, Saturday, and the last Sunday in April, a mini-convention is held at Springbrook State Park, near Guthrie Center, IA. It begins on Friday afternoon and concludes following Sunday lunch. Excellent programs & workshops are scheduled, interspersed with N4C business meetings, and wonderful food. Cost is minimal. It is a good place to become better acquainted with other photographers from the N4C region in a beautiful natural setting. September 13-15, 2018 Hosted by the Dubuque Camera Club. Theme "Presidents, Pixels & Pines"
between Guthrie Center & Panora, IA. 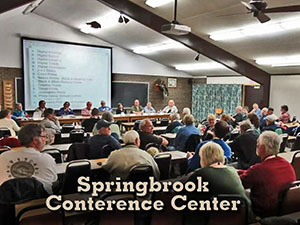 Each Spring, usually Friday, Saturday, and the last Sunday in April, a mini-convention is held near Guthrie Center, IA (For many years it was at Springbrook State Park). It begins on Friday afternoon and concludes following Sunday lunch. Excellent programs & workshops are scheduled, interspersed with N4C business meetings, and wonderful food. Cost is minimal. It is a good place to become better acquainted with other photographers from the N4C region in a beautiful natural setting. The Iowa DNR has informed us that the Springbrook Education Center will close for good March 13th, 2017. The state park will stay open. A new location will be found for the 2017 Spring meeting. Proshow transition selection was revised in version 4.5. This gives a Palette of the original transitions and lists the names in the newer versions of Proshow.